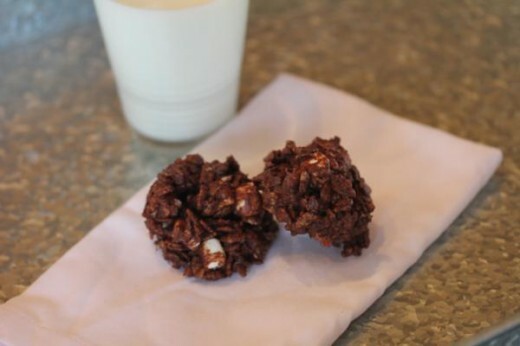 If you need a quick and easy cookie recipe that kids will love, and who doesn’t need more of those, then I have just the recipe for you today. And yes I know these are not the prettiest of cookies, but they really are delicious! 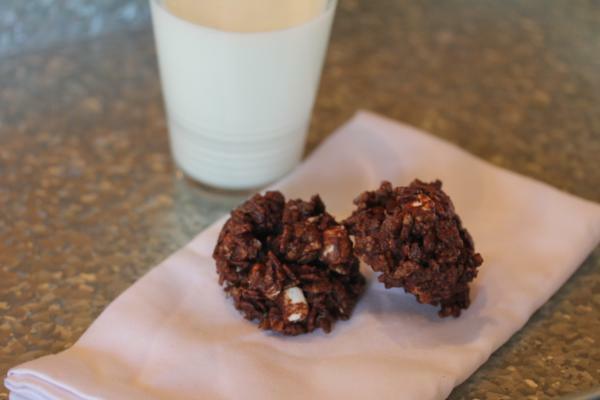 Chocolate Marshmallow Crispy Cookies are a take on my grandma’s chocolate rice krispy cookies. I took her basic recipe and add a few extra ingredients. Like marshmallows and peanut butter/nut butter. I still love my grandma’s basic recipe, but this is a fun way to change it up. And really I think we can all use more easy no bake cookie recipes that use ingredients we all have on hand. Place chocolate chips in a large bowl and microwave for 30 seconds on 50% power. Stir and continuing cooking at 50% power, stirring every 30 seconds until melted. Stir in crispy rice cereal and peanut butter. Carefully stir in marshmallows until combined. Drop onto cookie sheets and refrigerate until firm. Remove from cookie sheet to serve or keep refrigerated until serving.